There are no prizes for guessing the theme of this colourful online slot from 1×2 Gaming; it’s been difficult to escape the phenomenon of “I’m A Celebrity….Get me Out Of Here” and in fact Microgaming already have a game of that exact name. Celebrity In The Jungle avoids any direct references but it does have two separate bonus features so keep reading for more information. 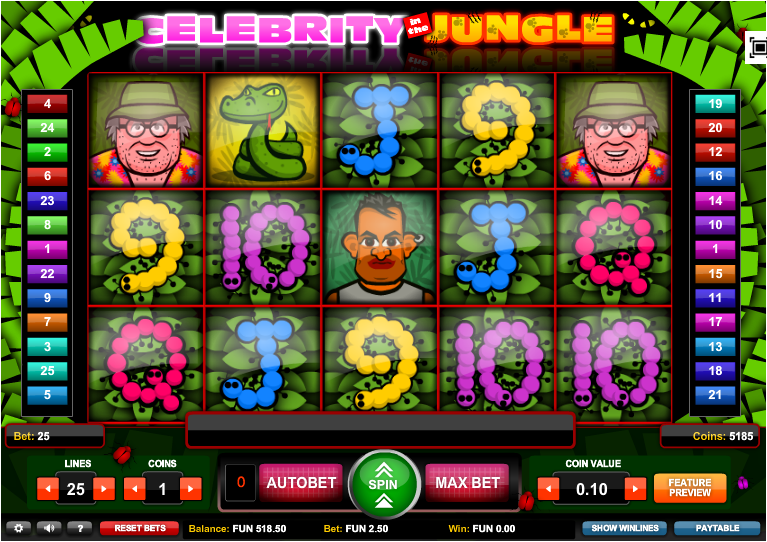 Celebrity In The Jungle is a five reel slot with three rows and up to twenty five paylines; the design is cartoonish and in line with many 1×2 Gaming releases – palm fronds sway gently in the breeze and the sound effects include lots of unnerving jungle noises. The four high value symbols are three contestants and a green snake, the lower values are the standard 9, 10, J, Q, K and A. The wild symbol is a big ‘Wild’ on a green background and there are two scatters – the girl with a gold star and the teeth – which activate separate features. The spins will start automatically when activated and all wins during this round will be doubled. To trigger this mini-game you will need to land three or more of the teeth-eating-a-wichitty-grub scatter symbols anywhere in view. You will now be taken to a screen displaying five boxes and all you have to do is open them one by one to reveal one of the famous gold stars for prizes. The more scatter symbols which trigger this game, the higher the potential prizes. 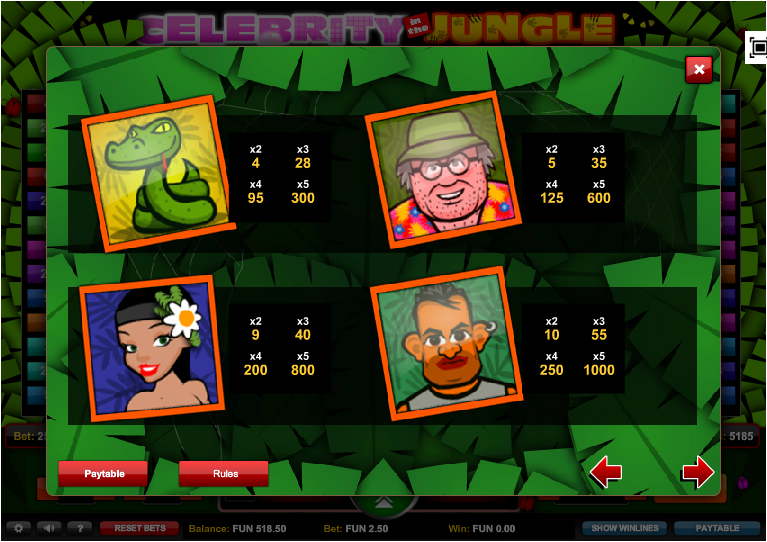 Celebrity In The Jungle is another enjoyable slot from 1×2 Gaming which retains a familiar design added to an amusing theme. It’s seems easy to trigger the features and it comes complete with a high RTP of 97.70%.